The 9th annual free Marin Camp Fair is in San Rafael at Dominican University this Saturday (Mar. 23), with free activities and over 80 exhibitors, allowing attendees to view a smorgasbord of camps, enrichment programs, schools, S.T.E.M. and S.T.E.A.M. programs, daycare, performing arts, preschools, cooking, educational, sports and other programs available this spring and summer. 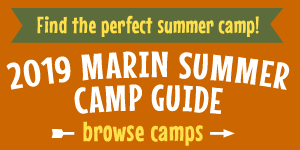 The Marin Camp Fair is the perfect opportunity for parents to do one-stop shopping for all the programs their children and teens want to participate in during the year. The free fair is in the Conlan Center Gymnasium at Dominican University. Marin Camp Fair is open from 11 a.m. – 2 p.m. with free admission, free on-site parking and free pizza for attendees. There are activities and demonstrations too. The first 200 families each day at the Camp Fair receive a free goody bag. There’s free pizza for attendees and a free raffle drawing for camps, SWAG and Bay Area KidFest tickets. Anyone bringing a can of food for the Food Bank will receive an extra raffle ticket for each can. Admission is free and there is ample free parking. Visit www.MarinCampFair.com for more information or to pre-register for a free family raffle ticket and pizza.